VOICE Network: VOICE Network supports Earth Hour 2010 ! 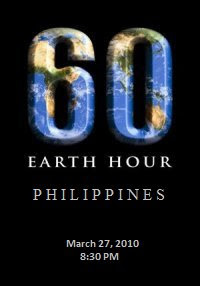 VOICE Network supports Earth Hour 2010 ! VOICE Network supports Earth Hour 2010. Below is the list of schedules/centers where you and your organization/s could get involved. Email us at voicenetworkph@gmail.com if you need to enlist your endeavor for this campaign. ACDO, VOICE CDO Cluster, etc. They’re still rebuilding in Aceh, and now we’re dealing with flash floods, and malnourishment.